Hiya Geeklings! How’s the week? How’s the weather? How’s the everything? So last summer I mentioned that I’ve always been a little on the fence about Anime and Manga. Well, I’ve had an experience recently that showed me I may be totally upside down on my whole perspective. Yep, Ali can eat crow on occasion. Happens to the best of us. And the reason for this change of heart is my new favorite thing ever. Three words (and a few exclamation points); Yuri!!! on Ice. This anime series made a splash when it debuted last October, and 12 episodes later fans have been hungrily anticipating a 2nd season. The show follows 23-year-old Japanese figure skater Yuri Katsuki, who when we first meet him is debating giving up skating after a devastating loss the previous season. He’s soon whisked back into competition when he catches the attention of skating champion Victor Nikiforov of Russia, who volunteers to be Yuri’s new coach. But the path back to the top will not be easy, as Yuri must not only battle his own insecurities but also fierce competition from skaters from all over the world, including another Yuri named Yuri Plisetsky, a hot-headed 15-year-0ld Russian prodigy. There’s a lot in this show that appeals. The animation is GORGEOUS! The routines featured here were choreographed by real-life skaters, so a lot of love went into them. Sure, there’s still the weird outbursts that have always kind of made anime a non-starter for me, but if you can get past that then you’ve got a true feast for the eyes. And the sparkly costumes! So many sparkles! The dynamics between the characters are amazing too. You’ve got skaters from several countries, travelling to different places in the world. Each have their own hang-ups, their own hopes and dreams, and their own way they relate to their fellow competitors. (BTW, there’s a Canadian figure skater. Of course there is. Few countries understand and appreciate ice the way we do. But he’s totally NOT a stereotype, which I applaud). There’s a lot of competition among the skaters, but there’s a lot of support as well. Between them, their coaches, their family members and friends, there’s a real portrait of how doing these kinds of competitions affects everyone. And there’s romance. My goodness, there’s romance. I’m not big on romance, but I was totally digging it here. They did it right! But there are also a couple of personal reasons why this show resonated with me. Waaaaaaaay back in the day, back when I was around 12 or so, I used to figure skate. Nothing much, no real competitions or anything to speak of, and I only did it for a few seasons. But I got a few jumps and a few spins in before I gave it up. I haven’t been on the ice in, like, a decade or something, but skating is something I can legit put on the resume of my life. 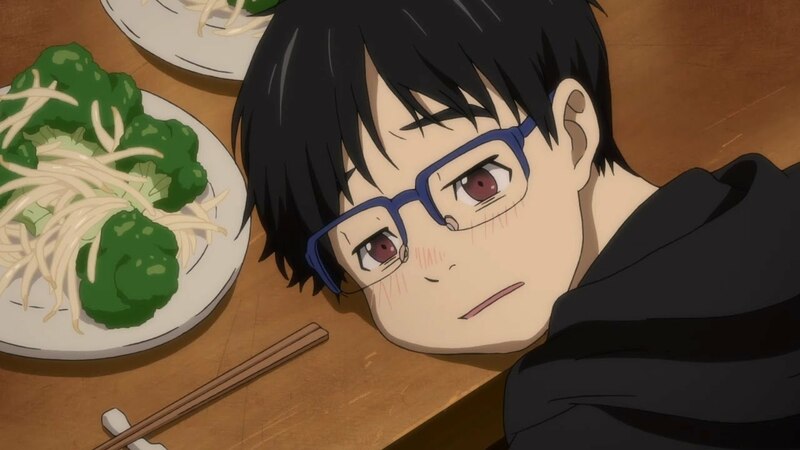 But one of the other things that kept me watching was that Yuri Katsuki is, in a lot of ways, basically me, and it’s always a special thing when you can truly see yourself in your fandoms. He’s a younger, Japanese, male-figure skater version of me. He’s insecure, awkward, anxious, lacking experience in certain things, puts on weight at the drop of a hat. All things I and a lot of other people can relate to. But he’s a genuinely kind and hardworking person, and when he skates in top form… watch out! But… Episode 7; that was when, for me, this series went from Really Good to Freakin’ Amazin’! Now, a lot of fans and non-fans know about Episode 7 by now. It’s when something really big happened between two of the characters (I’m not going to say what; spoilers). But as amazing as that moment was, that’s not what made this episode stand out to me. It was the time leading up to Yuri’s performance. Yuri is famous for getting nervous before a big performance (as I imagine any sane person would), and this time was no exception. What amazed me was how the animators, the writers and the actors perfectly captured what anxiety can do to someone. Getting quiet, not sleeping, nervous energy, trying to escape what’s making you so anxious, and just… the cloud that kind of hovers over you. I’ve grappled with it myself, and I could see it reflected in Yuri so clearly I was amazed. And watching Victor, who’s new at coaching, who cares about Yuri and knows what Yuri is capable of if he could just get past this, trying to help, trying to figure out what to do… The whole thing was so relatable, much more than in a lot of other formats where I’ve seen that kind of thing portrayed. Bravo! In the meantime, if you want to learn more about figure skating, we have you covered. For the basics on the sport, including history, moves and how competitions work, try How Figure Skating Works (a very apt title). If you’d like to learn more about Canada’s most famous skaters, try Taking the Ice: Success Stories From the World of Canadian Figure Skating. There’s a junior manga series about an 8th-grade girl named Maya who skates called Sugar Princess and a documentary called The Fabulous Ice Age, as well as other titles. There’s quite a few mentions of food in the show (Pork Cutlet Bowls! ), so check out our books on that as well. And if you’re looking to dip your toe into anime, we’ve definitely got some titles for you too. Let’s see, there’s Attack on Titan, Trigun, Soul Eater, Black Butler, Sailor Moon, Fruits Basket, Vampire Knight, Studio Ghibli movies. And we have manga too. Just… so much manga! Thanks for letting me share the feels Geeklings. Have an awesome week, post any of your own feels in the comments section below, don’t forget to sign up for Escape the Library, and until next time, End of Line.